Arguably the most hyped week of the science calendar, the announcement of the 2016 Nobel Prizes for science has brought molecular machines, research on "exotic states of matter" and a mysterious process by which cells degrade into the public consciousness. In 1895 the Swedish inventor of dynamite, Alfred Nobel, signed his last will and testament, giving the largest share of his fortune to a series of prizes in Physics, Chemistry, Physiology or Medicine, Literature and Peace – the Nobel Prizes. 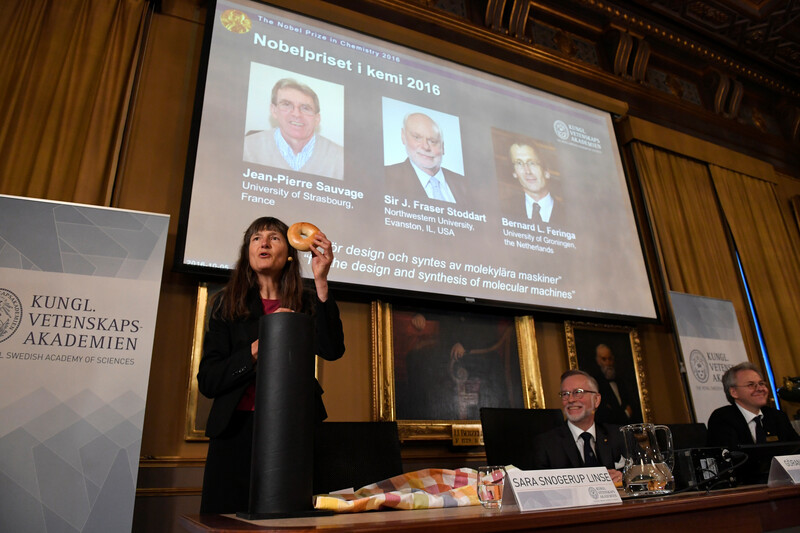 The five prizes were first awarded in 1901 and in 1968, the Sveriges Riksbank (Sweden's central bank) established The Sveriges Riksbank Prize in Economic Sciences in Memory of Alfred Nobel. 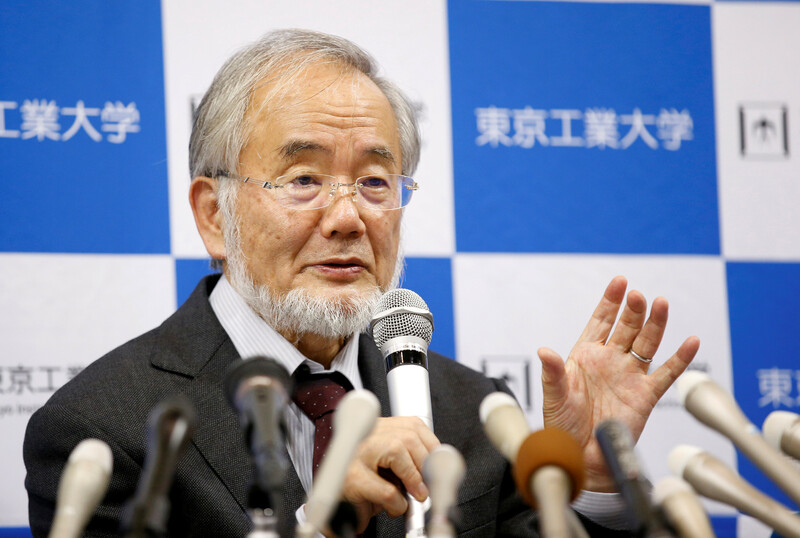 Against many predictions, the 2016 Nobel Prize in Physiology or Medicine was awarded on Monday to Japanese cell biologist Yoshinori Ohsumi for “his discoveries of mechanisms for autophagy”. Autophagy, which literally translates as “self-eating”, refers to the process by which cells degrade and recycle their contents. The term was coined by Belgian biochemist Christian de Duve in 1963. At that time, he and others (who all later went on to win the 1974 Nobel Prize in Physiology or Medicine for their discoveries concerning the structure and functional organisation of the cell) noticed that cells can dispose of their unwanted parts by enclosing them in a membrane that is delivered to the degradation machinery of the cell. Autophagy remained a biological enigma until Yoshinori Ohsumi identified the set of genes – first in yeast and then in humans – responsible for its control. It is for this work that he won the 2016 Nobel Prize in Physiology or Medicine, along with 8 million Swedish kronas (about US$ 938,000). While degrading our own cells might not sound like the greatest benefit to mankind, the typical hallmark of a Nobel Prize, it’s actually a natural process that our bodies use to survive. Autophagy allows us to fight off invading bacteria and viruses, survive starvation and make way for new cells. Initially recognised as a response to stress, Ohsumi’s work means that we now know that autophagy operates continuously at a base level, thereby playing a crucial role in cellular well-being. Autophagy degrades and recycles cellular components as well as eliminating damaged proteins and, following an infection, invading bacteria or viruses. Autophagy also contributes to embryo development and cell differentiation by ridding the cell of extra and unwanted material. Ohsumi’s discovery of autophagy genes and the elucidation of the molecular machinery involved in this process now mean that we can investigate how variations in these genes are associated with disease. Thus far, genetic disruptions have been linked to Parkinson’s disease, type 2 diabetes as well as certain cancers and conditions associated with ageing. The 2016 Nobel Prize in Physics was awarded on Tuesday to a British trio, all of whom now live and work in the United States. One half of the prize went to David J. Thouless, and the other half went to F. Duncan M. Haldane and J. Michael Kosterlitz “for theoretical discoveries of topological phase transition and topological phases of matter”. To put it simply, the trio discovered some unexpected behaviours of solid materials and used a mathematical framework known as topology to explain the odd properties, or phases. Their discoveries have since paved the way for designing weird and wonderful materials with novel properties, such as the ability to self-heal (see the video below from Davos 2016). Thouless, Haldane and Kosterlitz were able to identify the principles by which materials can suddenly change their form, or phase. Ice to water to steam is an example of a phase transition whereby a material changes with temperature. Aside from traditional states of solid, liquid and gas, materials can also exhibit phase transitions in their electrical properties, as is seen with superconductivity, a phenomenon in which there is zero electrical resistance if a material is cooled to a critical temperature. Here's another video which explains this process in more detail. What role does topology play in all of this? Topology is the mathematical study of the properties that are preserved through deformations, twisting, and stretching of objects. A doughnut and a teacup have the same topology, for example, as they each have a hole in them. A topological phase transition would occur if a doughnut were to go from having one hole in it to two holes. Alternatively, materials undergo topological phase transitions when they exhibit abrupt changes in their electrical properties. Thouless, Haldane and Kosterlitz’s work on “exotic states of matter” has already transformed how we think about materials and paved the way for novel materials with smart properties. Quantum computers and other revolutionary technologies may be yet to come. Perhaps the most controversial yet most esteemed (Alfred Nobel himself was a chemist) of all the Nobel Prizes is the chemistry prize. This year saw it awarded to Jean-Pierre Sauvage, Sir J. Fraser Stoddart and Bernard L. Feringa for “the design and synthesis of molecular machines”. Past years have seen an eclectic mix of scientists scoop the prize, from nuclear physicists to molecular biologists. This year’s trio – chemists from France, the UK and the United States – will split the prize money of 8 million Swedish krona equally between them. Sauvage, Stoddart and Feringa developed and produced machines on a molecular level capable of converting chemical energy into force and motion. The nanometre-sized structures, which are 1,000 times thinner than a strand of hair, could lead to the creation of molecular robots to deliver drugs inside the human body. Celebrated physicist and fellow Nobel Laureate Richard Feynman is often credited with inspiring the concept of molecular machines when he spoke about "swallowing the doctor" during his 1959 lecture at the California Institute of Technology (Caltech). This video of Professor Bradley Nelson, speaking at the Annual Meeting of the New Champions 2016, demonstrates just how much the idea of creating organic or inorganic molecular machines has permeated modern research. Each of the three Nobel-winning scientists played a different role in the development of molecular machines. In 1983, Jean-Pierre Sauvage found a way of linking two ring-shaped molecules together to form a chain, known as a catenane. Being linked in a chain allowed the molecules to move relative to each other, rather than being locked in place – the first step towards a moving machine. Just under a decade later, in 1991, Fraser Stoddart developed a rotaxane, a molecular ring that was threaded onto a thin axle and able to move along it like a shuttle. This paved the way for the creation of some of his later molecular devices, which included a molecular lift, molecular muscle and a molecule-based computer chip. In 1999, Bernard Feringa was the first person to develop a molecular motor, managing to get a molecular rotor blade to spin continuously in the same direction. Using these motors, he went on to design the first nanocar, a four-wheel-drive which consisted of a molecular chassis holding together four motors as wheels. Taken together, Sauvage, Stoddart and Feringa’s work has taken chemistry to a new dimension and shown how the miniaturisation of technology could revolutionise anything from drug delivery to smart materials and sensors to energy storage systems.